Gemini Observatory near-infrared image of the globular cluster Liller 1 obtained with the GeMS adaptive optics system on the Gemini South telescope in Chile. Summary: Using the advanced adaptive optics system GeMS, on the Gemini South telescope, astronomers have imaged a beautiful stellar jewel-box – a tightly packed cluster of stars that is one of the few places in our galaxy where astronomers think stars can actually collide. Scientists have imaged a cluster of stars, heavily obscured by material in our galaxy, where stars are so densely packed that it is likely a rare environment where stars can collide. “It’s a bit like a stellar billiards table; where the probability of collisions depends on the size of the table and on the number of billiard balls on it,” said Francesco R. Ferraro of the University of Bologna (Italy), one of the team members who used the Gemini Observatory to make the observations. 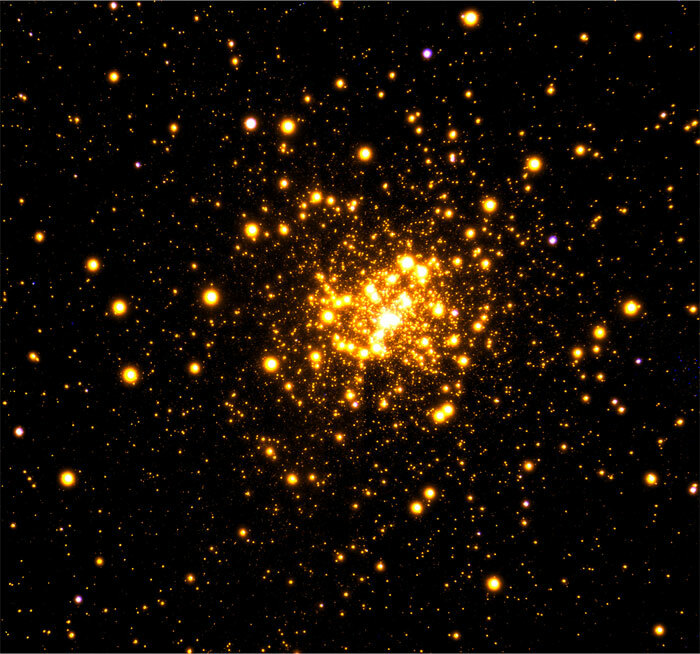 The cluster of stars, known as Liller 1, is a difficult target to study due to its distance and also because it is located close to the center of the Milky Way (about 3,200 light-years away from it), where the obscuration by dust is very high. The unprecedented ultra-sharp view of the cluster reveals a vast city of stars estimated by the team to contain a total mass of at least 1.5 million suns, very similar to the most massive globular clusters in our galaxy: Omega Centauri and Terzan 5. Geisler’s team specializes in the study of globular clusters near the center of the Milky Way, while Ferraro’s team is adept at the reduction of infrared data on globular clusters. Both groups worked together to obtain the beautiful and detailed observations of Liller 1 with Gemini. Liller 1 is a tight sphere of stars known as a globular cluster. Globular clusters orbit in a large halo around the center, or nucleus, of our galaxy and many of the closer globular clusters are spectacular showpieces, even in small telescopes or binoculars. “This isn’t one of these showpieces, it is so obscured by material in the central bulge of our galaxy that is almost completely invisible in visual light,” observed Sara Saracino, lead author on the paper, from the University of Bologna. Indeed, Liller 1 is located at almost 30,000 light years from Earth, in one of the most inaccessible regions of our galaxy, where thick clouds of dust prevent the optical light from emerging. “Only infrared radiation can travel across these clouds and bring us direct information on its stars,” commented Emanuele Dalessandro of University of Bologna. The observations of the tightly packed cluster used Gemini Observatory’s powerful adaptive optics system at the Gemini South telescope in Chile. A technical jewel named GeMS (derived from “Gemini Multi-conjugate adaptive optics System”), in combination with the powerful infrared camera Gemini South Adaptive Optics Imager (GSAOI), was able to penetrate the dense fog surrounding Liller 1 and to provide astronomers with this unprecedented view of its stars. This has been made possible thanks to the combination of two specific characteristics of GeMS: first, the capability of operating at near-infrared wavelengths (especially in the K pass-band); second, an innovative and revolutionary way to remove the distortions (blurriness) that the Earth’s turbulent atmosphere inflicts on astronomical images. To compensate for the degradation effects of the Earth’s atmosphere, the GeMS system uses three natural guide stars, a constellation of five laser guide stars, and multiple deformable mirrors. The correction is so fine that astronomers are provided with images of unprecedented sharpness. In the best K-band exposures of Liller 1, stellar images have an angular resolution of only 75 milliarcseconds, just slightly larger than the theoretical limit of Gemini’s 8-meter mirror (known as the diffraction limit). This means that GeMS performed with almost perfect corrections of atmospheric distortions. The international research team published the results in The Astrophysical Journal (article 152, volume 806, issue 2, June 15, 2015). The astro-ph version of the article can be found here. The observations for this project also included several other globular clusters. The results achieved on their first target, Liller 1, have been so important that they have increased their collaboration and are currently working on the other clusters which promise to deliver even more exciting science. Stellar collisions are important because they can provide the key to understand the origin of exotic objects that cannot be interpreted in terms of the passive evolution of single stars. Nearly head-on collisions in which the stars actually merge, mixing their nuclear fuel and re-stoking the fire of the nuclear fusion are suggested to be the origin of (at least part) of the so-called Blue Straggler Stars. But collisions can also involve binary systems, with the effect of shrinking the initial size of the system and thus promoting the two components to interact and producing a variety of objects like Low mass X-ray binaries, Millisecond pulsars etc. In particular Millisecond pulsars are old neutron stars reaccelerated to millisecond rotation period by mass accretion from a companion in a binary system. Indeed Liller 1 is suspected to have a large population of such exotic objects. Although no millisecond pulsar has been directly observed up to now, a large hidden population has been suggested because of the detection of an intense γ-ray emission (the most intense detected so far from a globular cluster). The Gemini observations indeed confirm that this is possible. “Indeed our observations confirm Liller 1 as one of the best “laboratories” where the impact of star cluster dynamics on stellar evolution can be studied: it opens the window to a sort of stellar sociology study, aimed at measuring the impact of the reciprocal influence of stars when they are forced to live in conditions of extreme crowding and stress.” concludes Ferraro.